In June 2012 three of us are going to Nome, Alaska for the GPAA Alaska Gold Expedition at Cripple River Camp. We already booked a reservation and also reserved three 4 wheelers. I was watching a DVD movie series called “Alaskan” which shows everything that goes on there during the mining season. You can purchase the movie set here. They have the sluice boxes for getting that fine beach gold, highbankers for shoveling fresh paydirt, various size dredges for the creeks, a vibration table for separating the gold from the black sand and a bunch of friendly people that operate everything. When we go up there, we will have a chance to experience all that stuff. Some people like to go metal detecting in the pushes while others like to go out on their own in search of that hidden gold patch. There are countless streams to pan and miles to drive around. One person got 4 ounces of flour gold in 1 week from the beach. That’s a lot of work if you think about it. Our main gold is to experience a little at a time. Each year we want to experience more Alaska gold mining. That is the plan anyway. I will be running a 4 inch dredge which means I need to get myself a 7mm wetsuit before I go. That water will be ice cold. I can’t wait to go fishing for a fresh salmon and be able to cook it right there. I haven’t done that in years. I learned so much from the first season. Mostly that it’s a bunch of hard work and having a good team that knows what the heck to do is crucial. I wonder where they are going to dig next? At last, the end of the year approaches. 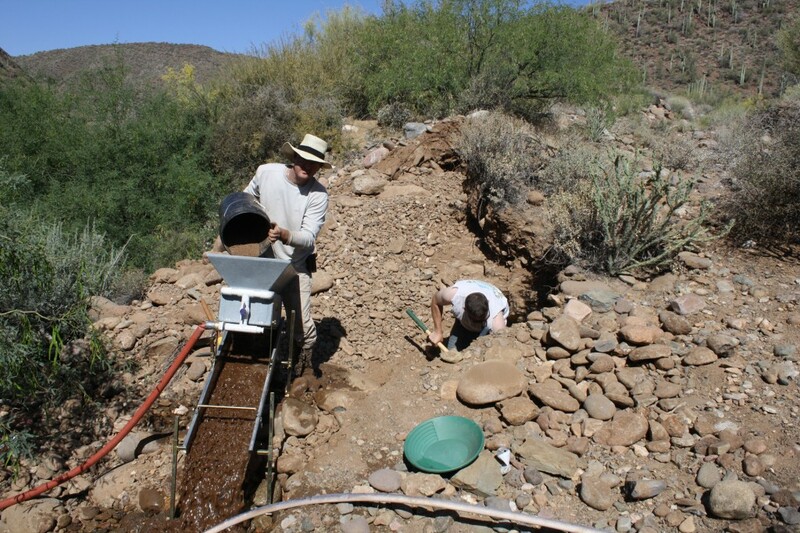 The air is cooler and we can now resume gold prospecting activities. First order of business is to have fun! I am going to ride the quad around and enjoy nature’s scenery and relax. I have been waiting months for this day. I won’t miss office life. We came back to Rock Springs in search for more of that yellow metal we saw last time. We now have more equipment and more manpower. 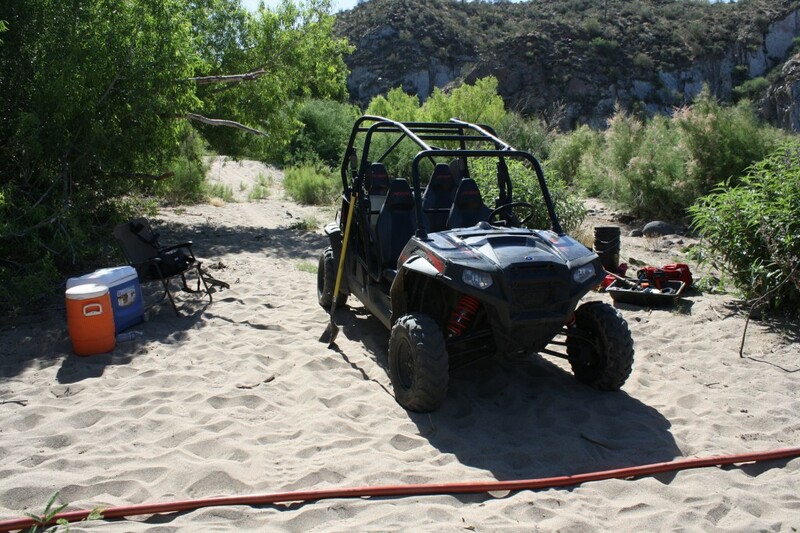 We drove our equipment to and from the site with a Polaris Ranger RZR 4 800. It was very comfortable to ride and handled much better than a quad. It took about 45 minutes to get setup and ready. We pumped water from the nearby creek which was about 200 feet away. 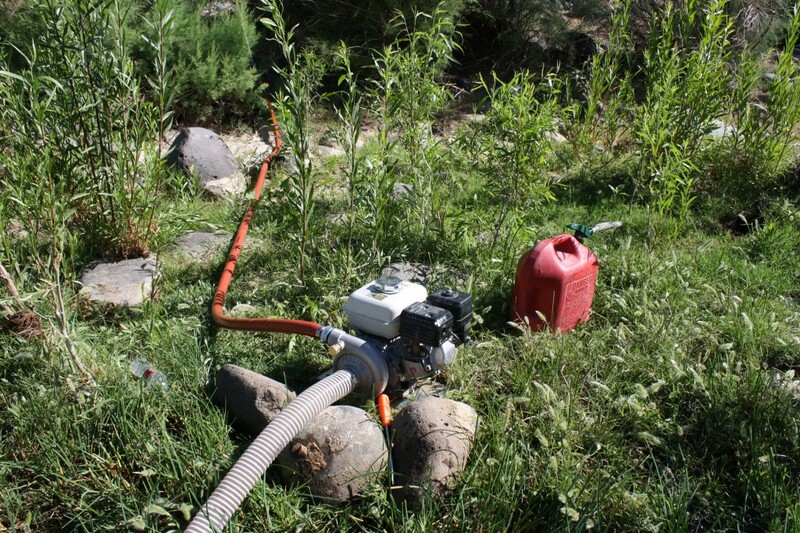 We used 1.5″ Discharge Hose. This hose is lightweight yet very tough and easy to transport. You can see the low pressure hose and foot valve go into a 5 gallon bucket. I drilled about 250 holes in that bucket to allow enough water to seep in. The purpose of the bucket is to keep the algae from building up too quickly around the foot valve and stopping water flow. We only needed to clean this once per hour versus once every five minutes. This helped a lot. 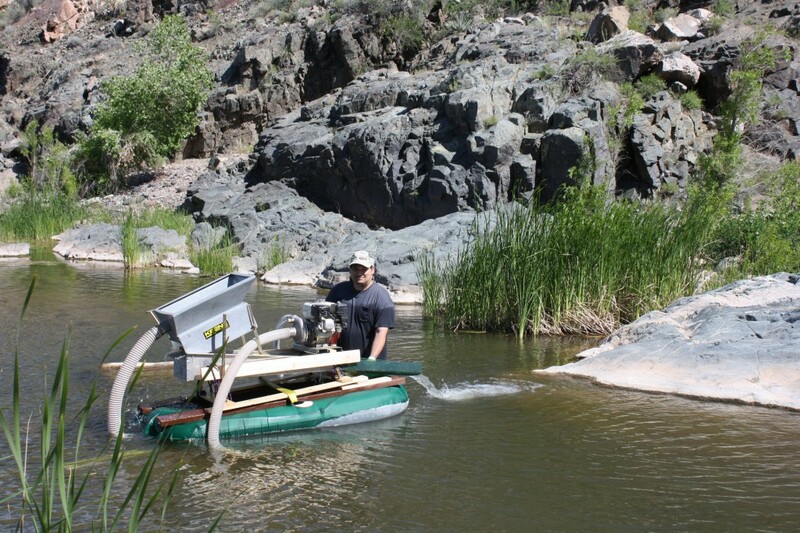 The “little pump that could” had no problem pushing the water 200 feet going uphill. We ran it at 90% throttle for about 7 hours and used less than one tank of gas. Josh, Brandon and I worked at least 1.5 tons of material. One ton is forty 5 gallon buckets. There is about two feet of sedimentary deposit lying on top of metamorphosed bedrock. Not sure where the source of gold originated from, but one old timer suggested it was deposited there about 30-35 years ago from a flood. I sampled many places around the bottom of the site and found no gold. It appears to be all in this hard packed sediment on this hill. It was a clear day and hot. Next time I will suggest using shade cloth over the work site. I will pan the concentrates later this week to see how much yellow metal was acquired. 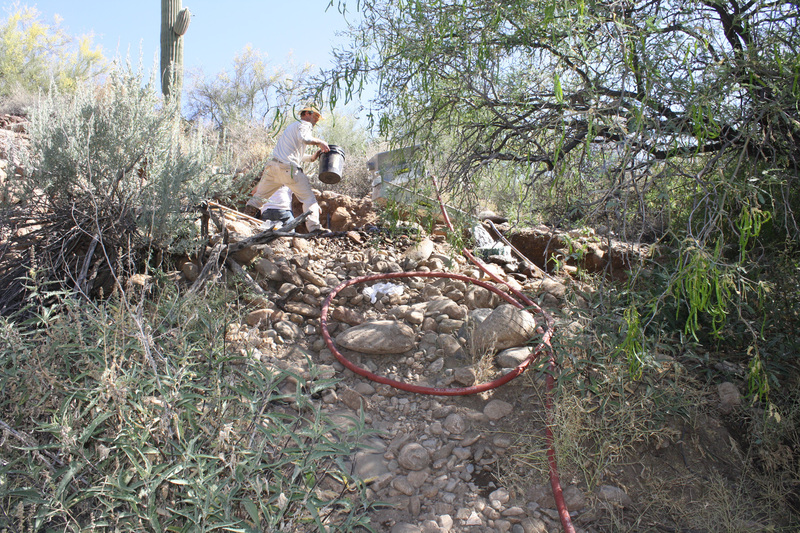 Last week Josh and I went with a mining claim owner to a remote location near Bagdad, AZ and were shown a beautiful place where the water flows over exposed bedrock all year round and the potential for gold might still exist. We prefer being near water most of the year because not only is it relaxing, but it makes finding gold easier. The location is a bit far from Phoenix, but its worth the drive. At one place we drove up with our 4 wheeler onto a herd of burros and took some pictures. As we left, one of the burros chased after us. Maybe it was being playful, but we did not want to find out. We had so much fun driving around. 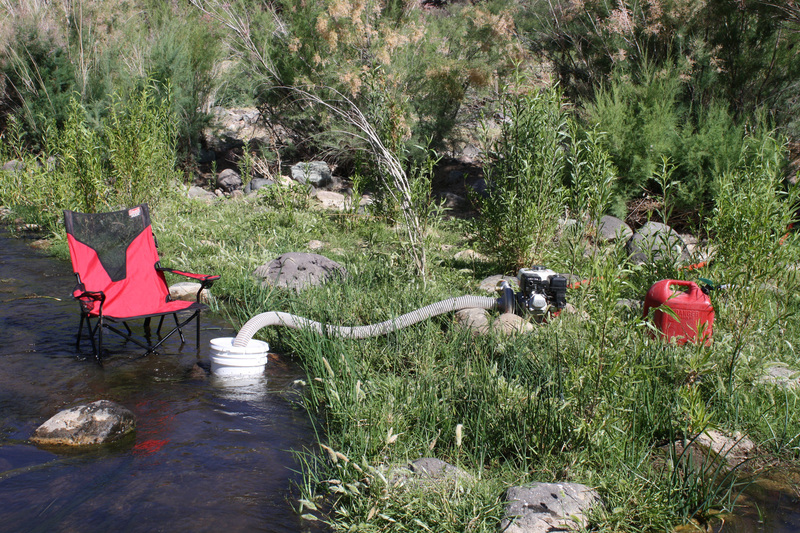 We wanted to use our 3 inch Keene dredge/highbanker combo in the creek, but it was too deep for it. We decided to make it float and test it out the following weekend. I did some research and found a compatible Keene flotation device for it, but it would cost about $900. I though that was ridiculously high. I took some time to figure out a more affordable design. It took a few minutes to think of a simplistic design and several hours later (with a little bit of trial and error) it was completed. For about $110, we had all the supplies needed to make something workable. 6 foot 2 person inflatable boat from Walmart ($20). 6 yards of Ripstop Nylon from Jo-Ann’s ($40). Grade B lumber from Home Depot (1×4 and 2×6) ($30). Pizza for my sister and her kids ($20). My sister had a sewing machine and knew how to use it which saved a lot of time. That was the hardest part of the design. 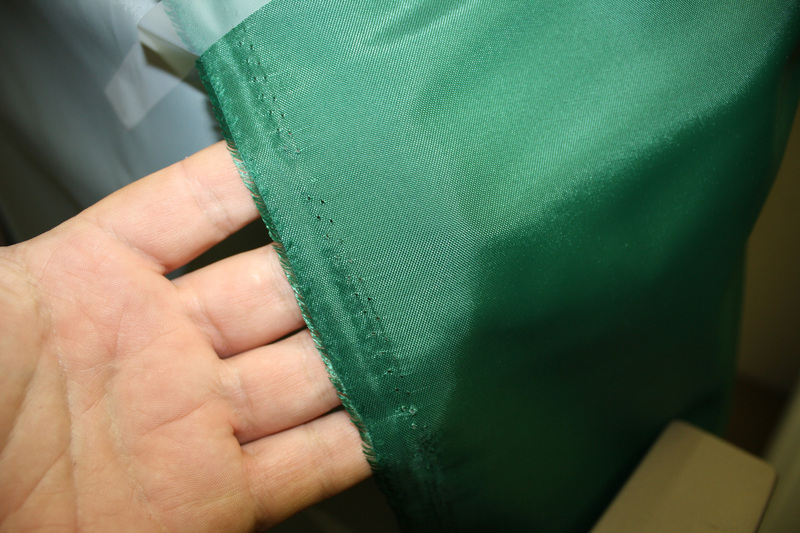 The nylon fabric provides exterior protection to the boat and it needed to be stitched on skin tight. Without that, the boat would have sunk from being jabbed many times. After all the stitching the next goal was to make a frame for the highbanker to sit upon. That was the easy part. Its just four boards that stretched across to evenly distribute the weight. Lastly we needed to mount the motor above the sluice box. It sits perfectly on the metal bar at the tip of the sluice box. I fastened a strip of foam padding across the bar to keep the two metals from clanging together during operation. The motor mount came with the motor and I simply attached a long board on both sides to be used as an additional platform that can be easily adjusted if needed. 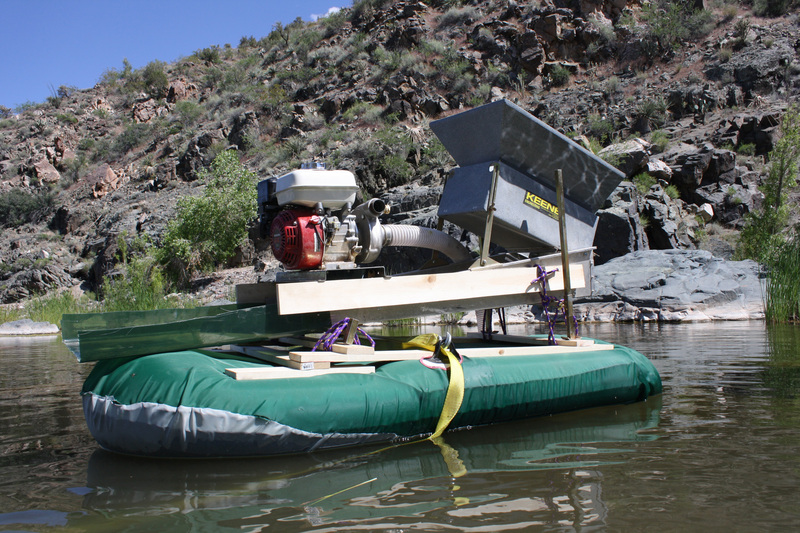 Yesterday Josh and I drove out to the claim again and tested our newly created floatation contraption for our 3 inch Keene dredge/highbanker combo. It was a success and was very stable. The Honda motor created nearly no vibration and it was not top-heavy. It looks unstable, but I assure you it was very much the opposite. I shoved it around and could not easily tip it over if I had wanted. 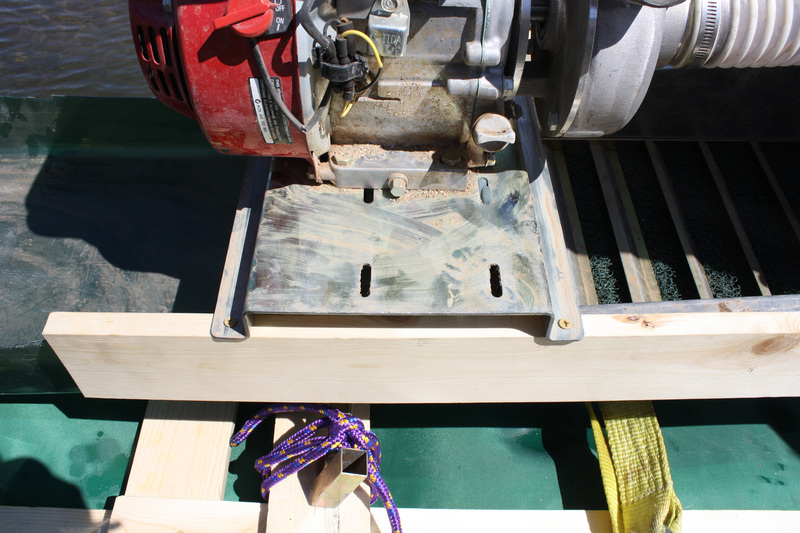 The sluice box was extended by a long green plastic container and affixed with two small bolts. The bottom of the container was cut off with a utility knife. We found it at walmart for only a couple bucks. When the dredge was in use use it added about 30 more pounds of weight. We estimated it was under 120 pounds in weight. The boat was rated for 370 pounds. We also needed to add two 2×6 boards under the wood platform to distribute the weight even more and bring the entire platform slightly forward. It was then perfectly stable and even. Most of the tailings from the hopper dropped on the back of the boat and bounced off, but next time I would add a board to direct the tailing off the boat. The angle of the sluice box is obviously low in these pictures, but it was raised to the correct level later when we started using it. That did not make it top heavy. We took turns dredging with our snorkel and masks for about 4 hours until we got a little sunburned. The water was fairly warm, the breeze was cool and it was a good day. I just found out that geocommunicator.gov Mining Claim maps have been discontinued. They have a notice on their web site. Well, I’m not that bummed. I stopped using it for locating mining claims after learning how inaccurate it was. I still used it as a tool to visualize the PLSS grid and SMA (Surface Management Agency) layers. It’s really no big deal that it is discontinued as there are other data sources available such as their Map Services API and LR2000. However if you are doing claim research, you really should be looking up information from your County Recorders office and LR2000. That is what BLM recommended to me. After searching Google, I stumbled upon a link to another geocommunicator server that is hosting the Mining Claim maps. I’m not sure how long that link will be available. Josh and I went to the Gold Show in Mesa yesterday morning. By the time we arrived the parking lots were almost full. Wow. If you have not went yet, check the event schedule to find one near you. Its worth going to. From rock picks to trommels and everything in between, vendors were selling it all. We walked around looking at all the neat stuff and talked to almost every vendor there about their products and was shown a demo. We were particularly interested in ways to recover fine gold of 150 mesh or higher from all our sand that the blue bowl was unable to recover. We were also interested in the GPAA Alaska Gold Expedition. A few items stood out from the rest that in my opinion had potential. Although every vendor claimed their contraption would recover more gold than another, we remained skeptic and looked at the design and compared it to our experience with similar devices and asked the vendor many questions. We have experience with spiral panning and always lost fine gold. We have adjusted the water flow and tilt axis many different ways but can never seem to find that balance of retaining the micro fine gold and removing the black sand. This is because water injected spiral panning agitates the concentrate too much. 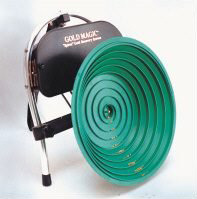 This device is different because the pan sits in the water which appears to cause less agitation to the concentrate which helps keep the micro fine gold in the pan. 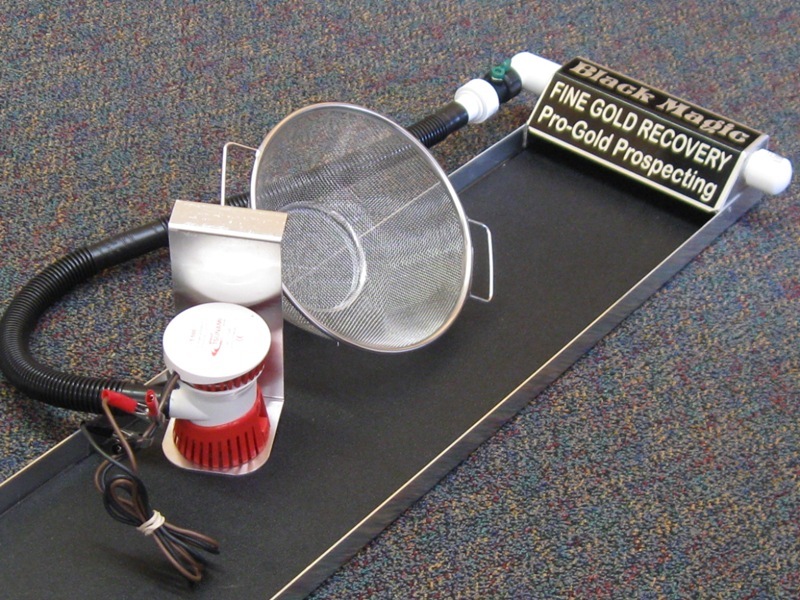 We saw this in action and I was impressed with the amount of gold it recovered. This product claims to recover gold without using water and it does so because I saw it in action, but it appeared to not recover micro fine gold as good as using it in water. Obviously this is the case no matter what product you use. Water is always preferred for fine gold recovery. I recommend this product over any other water-based spiral pan. We liked this design because it was based upon older design concepts which work very well for fine gold recovery. We saw a demo and were pleased with the results.. We purchased it and brought it back to the office and tested it on some concentrates which had already been blue bowled twice over. I was amazed at how much fine gold had been recovered. It was a little tricky getting the angle and water flow correct. Rub jet dry into the smooth black matting or else the water flow will not evenly distribute itself. Use jet dry in your water tank. Make sure to keep the pump away from the bottom of your water tank or else you end up with small bits of crap recirculating again. You should also use nylon stocking and rubber band over the pump to keep your water clear from debris. Make sure no bubbles are coming out of the top of the sluice or else a bubbles will hit and wash away your fine gold. I am thinking about adding a small strip of black ribbed matting to the end of the sluice box to help prevent gold from escaping. Store this product in a location or container so it will not get bent. Every good prospector knows that when you use a magnet in your pan to separate the black sands from the gold you end up unintentionally trapping gold in between and accidentally tossing out the gold along with the magnetite. This is why I never use a magnet anymore. However, we were shown a demo for this device and I think it worked quite well. I purchased it and tried it out for myself on some concentrate that had been worked twice over from the blue bowl and successfully separated the magnetite from the gold with little or no gold loss. Twirl the wand in a fast circular direction high above the concentrate but keep the tip in the water. Only do a little at a time to ensure your fine gold won’t be sucked away with the black sand. I sat down and got a demo from the people who created FootPrints. 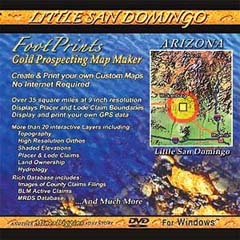 There are different sets of FootPrint software for known gold areas. Each software costs about $70. You can overlay GIS data such as high resolution topography, hydrography, wash maps, bedrock maps, PLSS grid, claim locations, and also retrieve historical information, updated county records such as location notice maps and claim owner information. It also has GPS integration so you can see where you are at on the map. I think this is an excellent tool to have out in the field while exploring because it makes finding information so much easier and faster with NO internet connection because all that data is cached on your computer. Although if you did not have FootPrints, you could freely research all the same USGS maps, BLM, county records and everything else from the various web sites (in my links section) and carefully plan your trip before you go out into the field, but there is a chance that FootPrints may be needed. We walked around more and met up with Tom Massie. We talked with him for a few minutes and got an autograph. It was neat to finally meet him after all the Gold Fever shows we watched. We bought more DVD’s and went to his lecture about the Alaska Gold Expedition. It sure would be nice to go back to Alaska for a visit. For those of you who do not know I was born there and I am Alaska Native. I think everyone should experience Alaska because it is very beautiful and you will end up with memories that last a lifetime. Below is the event calendar. I will be there in Mesa meeting folks, taking pictures and looking at all the goods. This is going to be an exciting year. 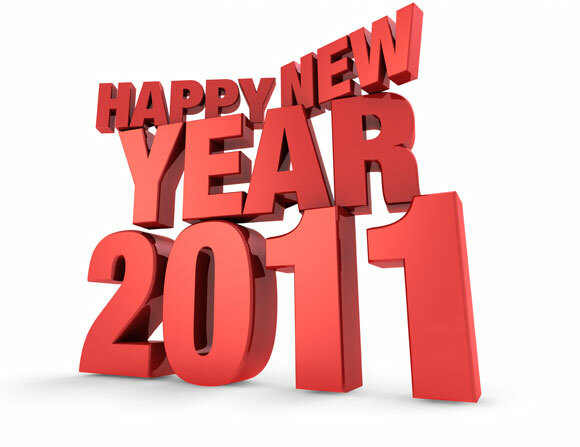 There has been a gradual increase of people visiting our web site ever since we started this early last year. We aim to be a useful repository of new information to the recreational miner. We will be exploring new areas, meeting more people and keeping you informed about new things we learn throughout the year.